For those of us who work in customer engagement, busy shopping days like Black Friday and Cyber Monday launch us into the season. But December is not all about extra coverage and busy support queues. There are also seasonal treats, trimmings and traditions that only make an appearance this time of year. Cassie D. brings a festive spirit wherever she goes, sporting rainbow hair all year ‘round! Here are her freshly painted rainbow tree and desktop mini tree. Martin H. enjoyed the Christmas tree lighting in his local town of Carndonagh, County Donegal, Ireland. The brass band playing beneath the tree includes his wife and two of his kids! Our cats are certainly feeling festive in their new spots beneath the trees! Here are Susie S.’s Miss Scarlett O’Hairball and Teresa T.’s Leela, looking very sweet. The town of Port-Louis in Brittany, France is also dressing up for the holidays! This is a photo of the newly lit streets in the town as well as the view from Morgan M.’s window. Très jolie! Here is a bit of DIY inspiration for those of you who are still considering how to decorate. 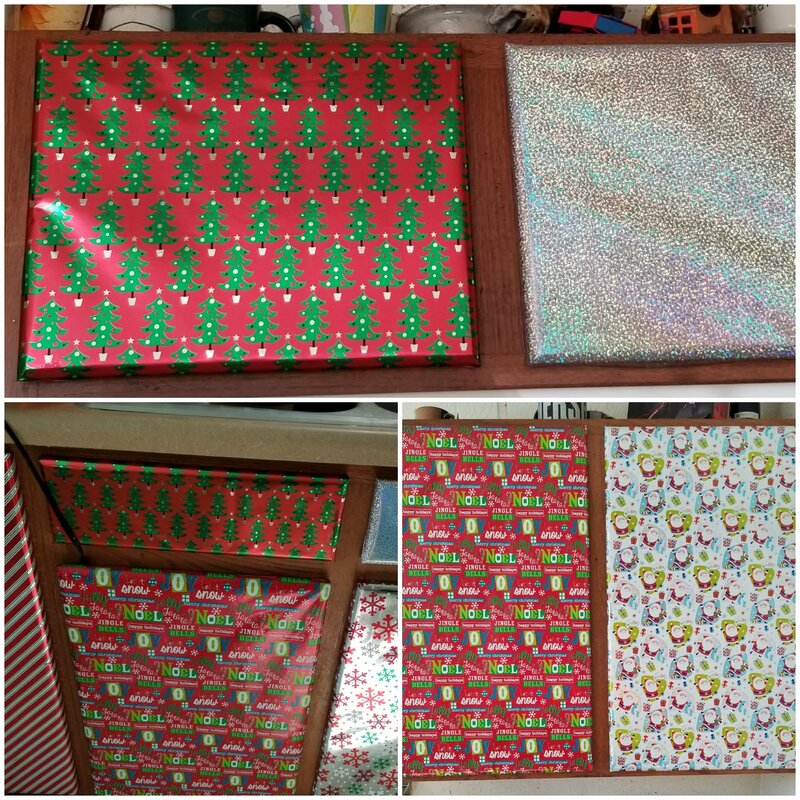 “My family’s tradition is to decorate our kitchen cabinets with wrapping paper. It started out when our kids were babies since it was a very cheap and festive way to decorate the house. Now that they are all grown up… they say it’s not the holiday season yet until they get their ‘Christmas Kitchen.’” – Kelly A. “While I could purchase a wreath from the store, there is something about crafting my own that gets me in the holiday spirit.” – Mimi S.
For many of us at ModSquad, the shopping isn’t complete until we’ve spoiled our furry friends. Here are Aliza R.’s Francisco and Annie, deciding whose turn it is to spin the dreidel during Hanukkah. Of course, it’s not all about toys. There are also hats! Here are Natalia S.’s cat, Abby the Tabby, and Rory F’s dog, Anana, looking very distinguished in red. 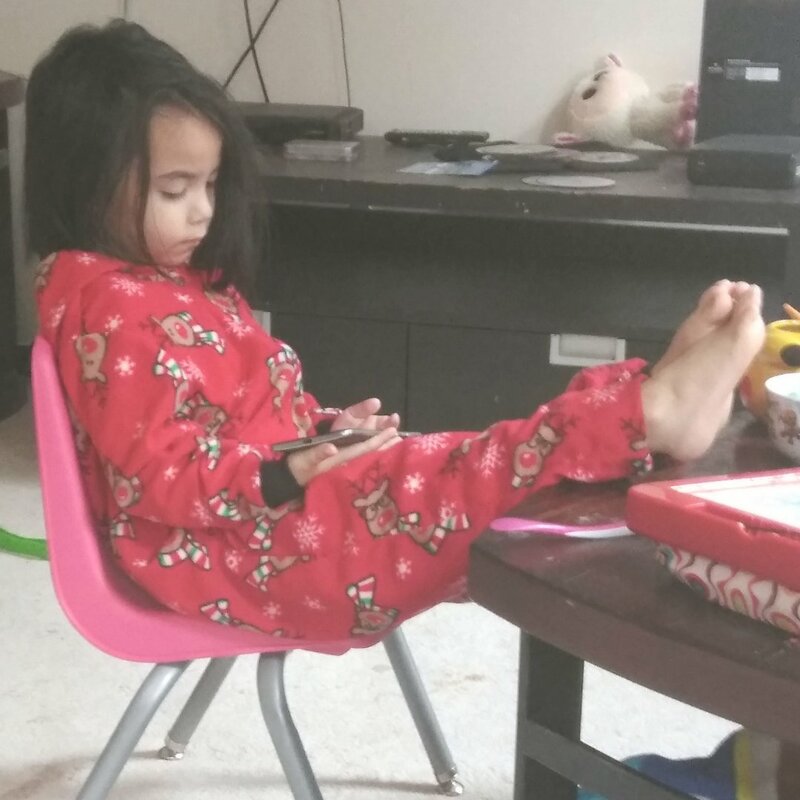 Here is Kelly C.’s daughter, rocking a reindeer onesie, and reminding us all that ‘tis the season to chill… especially with those you love most! Sandrine C. has enjoyed holiday traditions all around the world, from where she’s from in the southwest of France to her current home in Ireland (and many places in between). She carries her favorite pieces of each place with her, in memory and in practice: Saint Nicholas’ Day, Christmas Markets, festive jumpers, and fun with family around the fire. “Whatever country I was in during the holiday season, I always had laughs and wonderful moments with family and friends, a lot of people around a table full of delicious food… this is what represents this time of the year for me!” –Sandrine C.
Pro tip: The red velvet banana cake featured here was made and decorated by Sandrine with her kids. Here’s the recipe in case anyone is interested. Yum, thanks Sandrine! There you have it! The signs that the season is changing are all around us. Along with the cooler temperatures this month will bring to many parts of the world, may you also find the warmth of happy times with those you hold dear. Cheers to a wonderful holiday season! It is really neat to see pics of the season around the world. Sandrine-I’ve said this before – wish I lived closer!! Yum! Gina, you are always welcome to come and visit 😉 !